Getting the opening slot at the main stage at Reading and Leeds is pretty much implausible for a band with such a small back catalogue as Mallory Knox, but their performance at Peterborough on 17.11.14 proves why they’re so worthy of all of their success. Moose Blood were the first band on the bill for the evening and they were one to divide the crowd. Eddy Lawton’s vocals managed to make quite a melancholic sound actually really enjoyable. When listening to the band’s records before the gig, it’s easy to dismiss them as your average post-punk band with not really much else to it. Live, they have an extra bit of oomph and grit that can pull the punk fans in and push pop rock fans away – something that their records seem to do the opposite of. Fort Hope were next to play and were something that would bring the divided crowd back together. Regardless of the cheesy swaying of hands, clap-a-longs, and, in general, things that would make any sane person cringe, it’s difficult not to enjoy Fort Hope. They're full of so much talent and potential. Jon Gaskin embodies the perfect frontman of a band; he has an overwhelming vocal range and such a charming stage presence – admittedly slightly boyband-ish, but nevertheless, ideal for this kind of group. Even with the loss of one of the members, these guys still know how to put on a show. Since half the audience were quite obviously there for Frank Iero and, coming from such a high level band as My Chemical Romance – it’s difficult not to expect a lot from the guy. Despite the questionable beginning to the set, Frnkiero and The Cellabration’s performance got better and better with each track. There seemed to be a clear transition between sounds from the start to the end: the start was more gusty and growling, and the end was a lot more of Danger Days My Chem era. The more comfortable and reminiscent the sound became, the better the performance. It’s a real shame that almost half the audience decided to leave after Frank’s set as they missed a phenomenal headlining band. Mallory Knox are a band that go from strength to strength with each record they put out. Their most recent album Asymmetry is an incredible follow up to an almost flawless debut album and is guaranteed to launch the band into bigger and better things. For those of you who don’t know who Mallory Knox are, they are an alternative rock band from Cambridge that create the most honest rock music out there at the moment. It would be impractical to put them under the same umbrella as bands like You Me At Six and Lower Than Atlantis because there is so much more that Mallory Knox have to offer – but needless to say, people do it anyway. Playing a venue that looked a lot like a school P.E hall and is renowned for putting on musicals and theatre shows is a questionable prospect for any rock band, especially one in Mallory Knox’s position. The gig could have gone one of two ways; it could’ve been a complete disaster or an absolute triumph. I can confirm it was the latter. Opening with their two most recent singles ‘QOD II’ and ‘Shout At The Moon’ proved how far this band have gone in the past couple of months. With radio play on Radio 1 and support coming from everywhere; the crowd were ready for something special – particularly as the gig was in Peterborough. For fans living in a place like Peterborough and its surrounds, it’s clear you’ve got to completely lose it when bands visit because it could be years before another one – another good one – comes along. Mallory Knox are not like the other ‘rock’ bands in the charts. There’s something about them that separates them, and this is only highlighted even more in their live performances. Singer, Mikey Chapman, is one heck of a frontman. Chapman’s vocals are exceptional and he’s got this rare flair that make the whole band’s sound so raw. They have this punch that not many others have. It’s difficult to pinpoint the best tracks and best bits of this set because each track was presented with so much precision and ease. Whether they played songs from their EP released in 2011, their debut in 2013 or their second album released this year – all of the songs were performed faultlessly and received the same ecstatic response as the other. Combining ‘Resuscitate’ and ‘Oceans’ into a medley (is that a medley – I don’t know) was a f*cking great idea from the band. Now in no way am I saying that Mallory Knox are a metal band, but they somehow managed to bring a wall of death into their set during this so-called medley, which is pretty darn cool. Slightly dangerous but hey – that’s rock n roll, right? After the tedious walk off and walk on back to the stage (otherwise known as an encore), Mallory Knox played one of the best tracks from Asymmetry. Although ‘She Took Him To The Lake’ didn’t create as much of a stir as their more well-known songs, the track encompasses so many different subgenres of rock so incredibly well that it leaves the audience left in awe, so there really is no need to push into each other as a means of showing their appreciation for the track. Ending with their hit single ‘Lighthouse’ completely changed the attitude of the wonderstruck audience as normal anarchy pursued till the very end. 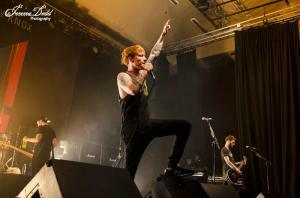 Mallory Knox are a storm in the making. They’ve already proved that they have the potential to play big name festivals as well as releasing great album after great album. Not only do the band sound phenomenal on record, but their brilliance is further enhanced in their live performances. This is a band you need to see live to fully appreciate the power that is, Mallory Knox.